IN DAYS LONG PAST, the mythical realm of Hyperborea rose to world-shaking prominence, but their greed and lust for power was also the cause of their demise. Just before the cataclysm that destroyed the ancient kingdom, a few wise sages threw up a magical barrier, containing the violent blast, sealing off the land and saving the outlying provinces from the apocalyptic event. Over long centuries, six rival nations(The Red Duchy, The Emerald Kingdom, The Purple Matriarchy, The Golden Barony, The Coral Throne and The Celestial Reign) were born from those survivors and a fragile peace was all that kept these six nations from chaos and war. But that peace was not to last. When the magical barrier suddenly collapsed, and entire new land lay before those kingdoms, full of the riches and ruins of the legendary Hyperborea. Each nation now rushes to explore and exploit the hidden treasure of that long-forgotten age, but only one can ultimately prevail. Will you employ brute strength or low cunning, scientific brilliance or magical artefacts? 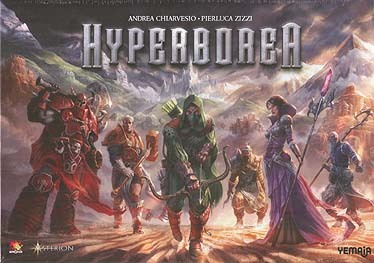 CAN LEAD YOUR PEOPLE TO THE ULTIMATE DOMINANCE OF HYPERBOREA!